Foster parents for the boys turned into adoptive parents. NEWPORT, Ky. — They say home is where the heart is, but three brothers found it in a Campbell County courtroom. Brothers Wesley, Brody and Bryson were in danger of being separated when they needed emergency placement in a foster home. They were in the system for about four years. But then a couple who had taken them in before in a pinch came to the rescue again. This time it's forever. 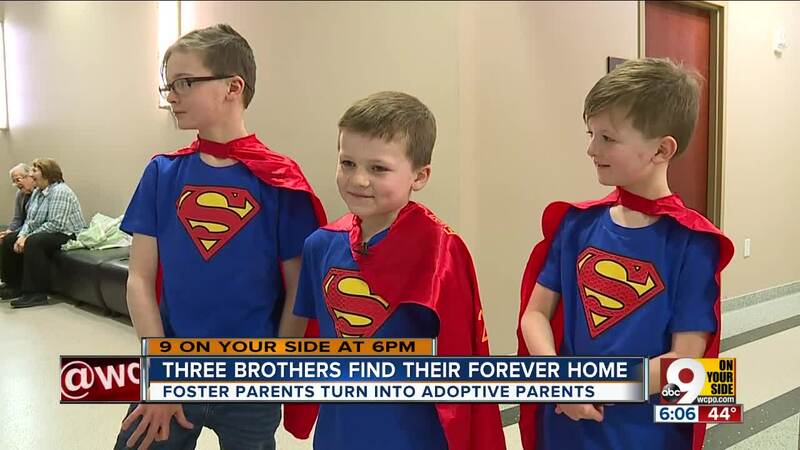 Hollie and Bryan Schroers adopted the three boys, meaning the brothers will remain together. "It's just a big day — almost like a wedding — taking on some new people, making a whole new family," Hollie Schroers said. "We already had four, three more and maybe another here soon." The Schroers said Wesley, Brody and Bryson had "been through a lot." "They've had a lot happen to them," Hollie Schroers said. "So they finally get that, 'We're permanently here and nobody can take us away anymore.'" After the adoption, the Schroers were heading to Flipdaddy's and Build-A-Bear, so the boys could mark the day by "adopting" a bear of their own.